When I heard the Joovy Groove was improved I jumped at the chance to test it out. The great thing about redesigned models is they have been around long enough for the manufacturer to know which features to keep and what areas need tweaking. I think Joovy has got this model perfect! The look of this stroller is sleek and modern. The new frame is made from rectangular aluminum as opposed to the traditional tube shape framework. I like that aside from the fabric all parts are gray in colour, giving this travel stroller a unique, fresh appearance. The super durable 600D fabric comes in Blueberry, Greenie, Orangie and Black and will be sure to hold up to anything your little one throws its way. There is light reflective material for added safety and peace of mind. Out of the box I simply popped the wheels and the canopy and was ready to roll. 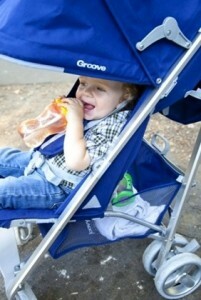 The Groove is for babies 6 months to 55lbs so it will accommodate your travel stroller needs for many years. My 40lb 6 year old has had a couple rides in it when very tired and he fits quite comfortable with his feet up on the footrest. To ensure your little one is comfortable it has a padded 5-point harness and a recline that goes back to 146 degrees (almost flat for a sleeping baby). I like that I can lay it back while my son is sleeping using the one handed strap mechanism without disturbing him. Unlike some other travel strollers, the Groove has a solid board backrest which helps prevent your child from slumping or slouching. 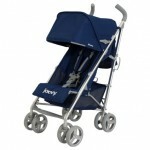 Joovy had parents’ comfort in mind when designing this stroller too. The foam rubber padded handle bars are a great height at 42 inches from the ground and both my 6’6” husband and 5’5” me find it to be a comfortable push height. Speaking of the push, the Groove is the smoothest I have experienced with a travel stroller thanks to the 6 ½ inch rubber wheels with sealed bearings. It easily handles most surfaces like a dream and for times when you need to multitask it steers great with a one handed push. 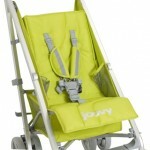 I love that Joovy thinks of the extra things for parents and children alike. The two mesh pockets in the seat are a great place to hold my toddler’s sippy cup and favourite toy while we are out on walks and he can access them himself. 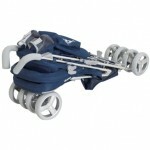 For the parents the back of the stroller has a zippered pouch great for things like tissue, keys or a wallet. Above the pouch are two cup holders great for bottles or cups with lids or even used as an extra pocket for little items or a tube of sunscreen. The basket is quite large for this size stroller and I can fit my large diaper bag in it without any trouble, although it is tricky to access when fully reclined so just remember before laying the seat back to get anything out you may need. 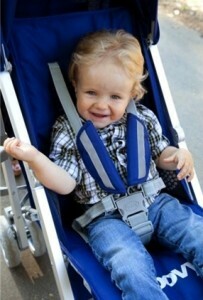 The removable canopy on the Groove has your baby covered and covered, yes I said it twice! It is a fair size canopy that extends down for even more protection in direct sunlight. A roll open peek-a-boo window lets you keep an eye on what your baby is doing without having to stop and look around which I admit I have done several times with my stroller that doesn’t have the window. This is by far the easiest stroller to get in and out of my trunk as I quickly learned I could open it and fold it with one hand. To open you simply pop the lock latch and step down on the frame support bar on the back – it literally takes a couple of seconds and I have done it many times with a squirmy toddler in my arms. Closing is just as easy, step down on both back wheel brakes, pull up on the bar handle and step or push down on the release bar and it folds down and locks all by itself with very little effort on your part. At 17lbs it is surprisingly easy to lift in and out of our car and truck with one hand using the rubber carry handle. 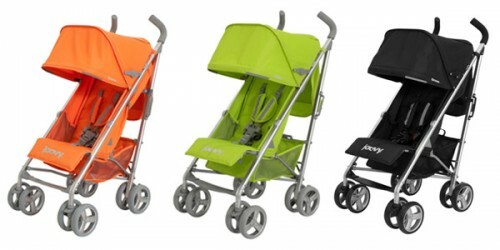 At $199 this Joovy Groove is a great value for a travel stroller with extra features. Thank you Joovy for sending us the Groove for review. Joovy strollers are one of my favorites. I see them everywhere in the malls here in Jersey. You did not mention how heavy/light the stroller feels.